Group classes are a great way to share fun and new skills among friends or coworkers. Participants get to collaborate, problem-solve, and explore creativity while gaining practical know-how and, depending on the class, a pretty cool project to take home. Choose from the Menu of Classes below, or work with us to create a custom experience for your group. Contact us to arrange a group class. Geared towards private groups that want to take one of our existing classes together, whether friends and family, workplace teams, youth groups, neighborhood associations, or your own flavor of network. Everyone in the group engages in their own project in a fun and educational setting that encourages skill-building, collaboration, creativity, and camaraderie. Ideal for team leaders, managers and employers. Looking for a project and an accompanying hands-on experience to bring your team together around something special? Our custom workshops boost morale, lower stress, re-envision team dynamics, and spark creative thinking. These workshops will be scoped and priced on a per-project basis, including design services. Non-profit and community group pricing available. Learn how to accurately cut and assemble pieces to make a storage cube - aka "a box." Sounds deceptively simple, but the skills you'll acquire are the building blocks of furniture, cabinets, rough framing, or even just more boxes! Miter cuts mean more than just picture frames. They're used in house trim, furniture, boxes, and so much more! Build your carpentry skills, and take home way more than a really cool frame. (But also a really cool frame.) Please note that frame sizes are limited to 8"x10" or smaller to keep class time and cost reasonable. Make an awesome chair while taking your woodworking skills to a whole new level! Learn how to accurately cut, assemble, and finish raw lumber to make this collapsible chair. Top and bottom sections nest for easy storage, or slide together to make a quick and comfortable chair when you need it. Cutting boards, tabletops, butcher blocks, and furniture... many woodworking projects require a "glue-up." In this class, you'll make a simple cutting board, and learn each step hands-on, from cutting to clamping to finished product. Featuring one of the most versatile and frequently used tools in carpentry and woodworking, Tablesaw Bootcamp provides essentials on maximizing use of your tablesaw in cabinetry, furniture-making, and more. Learn how to use it for box-joints, dados, rabbets, angled cuts, and other essential woodworking. Come learn how to fix common plumbing problems without having to hire a plumber. We'll cover repairs as well as replacement of sink faucets and drains, water supply hoses, and toilets. Whether you're a homeowner, renter, or remodeler, you'll want to DIY the crap of these simple fixes! Bring a drawer from home to give it an organizational makeover, or find one at our store before class to create a hanging display for your 80s vintage troll doll collection, spices, or other what-nots. Struggling to organize all your stuff? French cleats are a sturdy, modular system for storage and organization, whether woodworking tools, sewing supplies, books, or even kitchen gear. Bring 1-2 items to this very hands-on workshop, and we'll guide you through designing and building custom storage for your own tools and supplies. 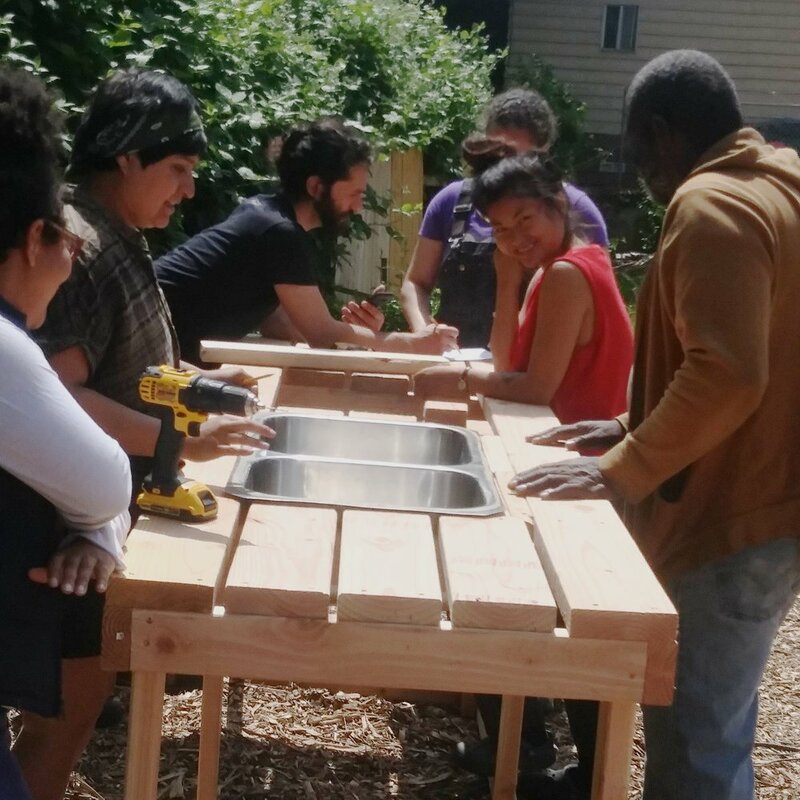 This class is designed for students who want to learn how to turn salvaged or rough-sawn lumber into finished material that’s square, flat, and ready for a furniture or craft project. A great next step for folks who have taken an Intro to Carpentry class (or equivalent) and want to tackle finer woodworking. Class will focus on reclaimed lumber, but the skills and processes apply to new materials as well. Got a dull chisel, knife, scissors, garden tool? Bring a tool or two to class, and learn the basics of tool sharpening in a very hands-on way using sandpaper, metal files, and sharpening stones. Make a classic toy that walks or hops using gravity. Sure to delight youngsters and oldsters alike! Choose from a variety of animal shapes, and prepare to impress yourself with what you can do using a few simple tools and scrap wood. Contact us to arrange a class for your group! We'll get your response as an email, so this will be the actual subject line. Tell us what class you're interested in. If a custom experience, briefly describe what you have in mind. Approximately how many people will be in your group? What's an approximate date you'd like to hold this class that is at least 2-3 weeks out? Anything else you'd like to let us know about your group and what you're looking for?